Our ground crew headed out yesterday with the maintenance trailer, generator, fuel trailer and our four large Fords to meet the airship in Texas. Aside from a flat tire, they're making good progress. 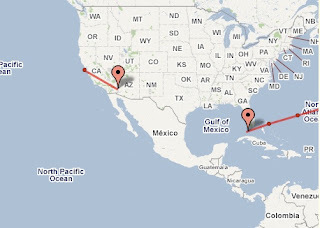 We are tracking them on our website too (no side trips to Las Vegas for them...!). ETA Beaumont is Saturday for the airship! I love being able to watch this progress. As an Oakland resident, I'm looking forward to seeing this airship on a regular basis. An early welcome to Texas!